Thanks to the hard work of many professionals before you, people are finally moving out of the mindset of massage as a luxury. And thanks to clinically trained therapists like yourself, more and more are seeking massage for pain relief due to injury or chronic illness. There exists, however, a whole lot of middle ground that is routinely missed, namely, massage as a means for coping with the regular stuff in life. A bad day at work. The aches of aging. Or pregnancy--oh, pregnancy! No serious athlete would consider competing without training, and no one - man or woman - should go into the pregnancy process without the same. After all, the structural changes a female body can undergo in 9 short months is simply amazing. And sometimes pretty uncomfortable! A good pregnancy massage class will teach you all about that. But a great massage class will consider how pregnancy affects both partners' bodies and minds. 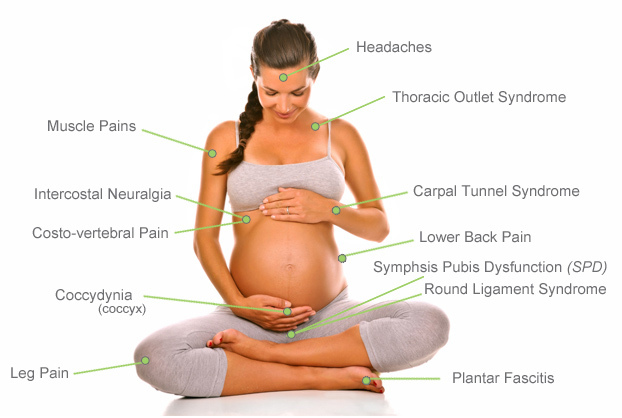 A great class considers both partners in all stages of pregnancy: pre-, peri-, and post-natal. I'm looking forward to a great class. 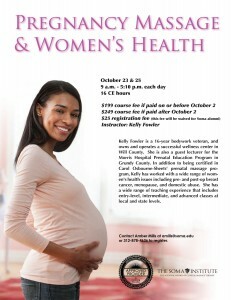 Join Kelly Fow ler as she teaches Pregnancy Massage and Women’s Health at The Soma Institute on Friday, October 23 and Sunday, October 25. For more information on pricing and class times, please contact Amber Mills at amills@soma.edu.